Kioti Tractor, a division of Daedong-USA, is expanding its PX tractor series with the launch of three new models: the PX9530PC, PX1053PC and PX1153PC. “We know our customers typically use this horsepower range for hard-working chores on their property, so we designed Kioti’s new PX Series models to be even more powerful, yet still comfortable and versatile to help tackle the tasks at hand,” said Peter Dong-Kyun Kim, president and CEO of Daedong-USA, Kioti Tractor Division. The PX9530PC, PX1053PC and PX1153PC feature 93-, 103- and 110-hp Tier 4 compliant diesel engines, respectively. Outfitted with a synchronized power shuttle transmission, the new models provide smooth shuffle operation and allow the operator to perform loader work without pressing the clutch pedal, the company said. In addition, the new models offer a lift capacity of more than 8,000-pounds and deliver PTO speeds ranging from 79.1 hp to 92.2 hp. The PX Series models come standard with dual remote hydraulic valves to accommodate a wide variety of attachments and implements. Additional features include a cup holder, front and rear wipers, adjustable steering wheel and instrument panel and a ventilating roof panel. The PX Series also features a larger fuel tank with 34.3-gallon capacity. 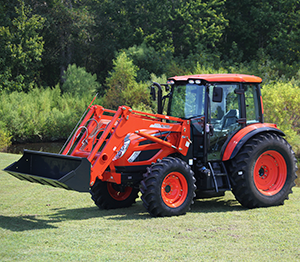 The Kioti PX9530PC, PX1053PC and PX1153PC tractors are available now at participating Kioti Tractor dealerships.